Barns are agricultural buildings used for storage of farm equipment, grain, and animals as well as providing a covered workplace. They often include pens of various sizes used in sheltering animals from the weather. Some styles feature a feed room, a tack room, a silo for storing grain, and an indoor corral for providing veterinary treatment to sick animals. Barns are a staple in rural American architecture even to this day. House Plans and More has a great selection of classic barn plans to choose from. 741 Sq. Ft., Width 44'-0", Depth 52'-0"
2400 Sq. Ft., Width 50'-0", Depth 48'-0"
4800 Sq. Ft., Width 40'-0", Depth 60'-0"
2152 Sq. Ft., Width 44'-0", Depth 30'-0"
900 Sq. Ft., Width 50'-0", Depth 30'-0"
865 Sq. Ft., Width 20'-0", Depth 24'-0"
1806 Sq. Ft., Width 42'-0", Depth 40'-0"
1647 Sq. Ft., Width 28'-0", Depth 36'-0"
1490 Sq. Ft., Width 36'-0", Depth 24'-0"
2400 Sq. 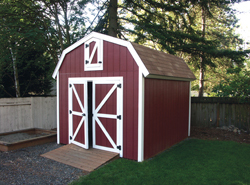 Ft., Width 53'-0", Depth 40'-0"
Our collection of project plans includes many styles and sizes of barn plans perfect for your building needs. We offer detailed blueprints that allow the buyer to visualize the finished project, down to the smallest detail. With a wide variety of plans, we are sure that you will find the perfect do-it-yourself project to fit your needs and style.